Stop, toy companies. Stop this madness before somebody gets hurt. Hot Toys, they of super-realistic action figure fame, also make 1/6 scale Star Wars figures. 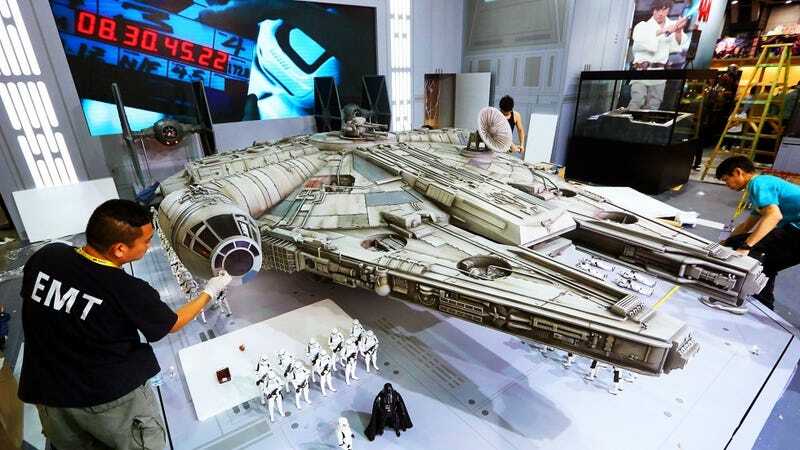 For the Ani-Com and Games Hong Kong show going on right now, they decided to also build a Millennium Falcon to stick some in. With the figures being 1/6 scale, the Falcon had to be big to house them. Real big. Like, 18x12 feet. Or, bigger than a lot of people’s cars. The Falcon isn’t available to buy—it’s just a display thing for this show—and for that, we should be thankful (though Hot Toys are selling a replica of just the cockpit). Individual figures normally run $200-$300, so this thing wouldn’t just be as big as a car, it would probably cost as much as one.